The family-sized Vidalia 440 Gas Grill still has the same versatility as Vidalia's larger versions, but in a size more appropriate to a summer cookout at home. With this grill you're not limited to flipping burgers or steaks -- while you do that, you can roast chicken or ham, or shift over later on to steaming vegetables and seafood. Vidalia's creative engineering divides the 440-inch cooking grid into two zones. 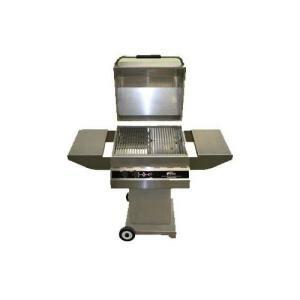 The first zone, over the two 20,000 BTU stainless steel burners, is for direct heating and grilling. The second zone -- the other half of the grid -- is convection heated by the burner air flow. That side is for slow cooking and roasting, and is well away from any flare-ups, so no rotissierie is necessary. On the indirect side, a special pan slips under the grate to hold water and spices and catch drippings. That converts to steam and bastes the roasting meat in its own juices. On the direct side you can put charcoal or wood chips in a removable briquette holder, and either cook with charcoal or use the chips as a source of delicious smoke. Pull out the briquette pan and set the water pan directly over the burners if you want to steam vegetables or seafood directly on the grill. It's even possible to cook in the water pan at the same time you steam food above it. Although the gaps between the end tables and the main body of the grill prevent the tables from getting hot, I see this as a potentially awkward problem if you place utensils there that could fall through the gap or roll away. The solid construction, versatile design, and generous warranty leave little else to criticize. Compare this with the Vidalia Built-In Convection Gas Grill.